Beer. Food. The game. Comfort. It’s not decorating the Taj Mahal. You’re not looking to have wood grain in your deck boards that matches the flow of your grass blades, or patio tiles that complement the shutters. No, you just want a space where you and your buddies can relax, enjoy the game, and crack open a beer. You probably wouldn’t mind some traditional game-day food either. It doesn’t have to be complicated. 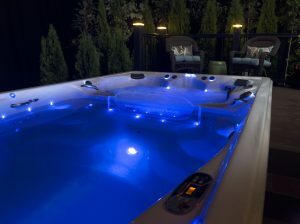 Best place to start is with a hot tub or swim spa. While it’s not your traditional man cave recliner, it’s probably leagues better if you really think about it. Recliners have nothing on massage jets that keep you relaxed even when that blind ref calls an unnecessary flag on the play against your team (well, relaxed enough that you don’t spill your beer this time). And once you’ve picked a top-notch swim spa that will house you and your game-day bros, you need a TV, of course. An outdoor man cave presents some challenges for electronics, but something like The TV Shield can remedy that. You need food. A man cave is not a man cave without good food. And if you’re going to be outdoors, then the only real option is an outdoor grill — after all, you can’t barbeque in the basement, so you’d better take advantage. 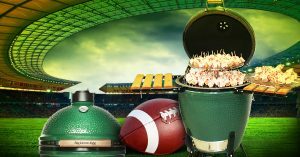 Whether you choose something like a Green Mountain Grill, or go full throttle with a Big Green Egg, chips and dip just won’t due anymore. Listen, South East Spas can help you get started on this outdoor man cave plan. We’re here to help you find the right hot tub for your space and then pull it all together seamlessly so you can get back to shouting at those refs (with just a little more relaxed restraint now that you’re chilling in a hot tub for the game). Give us a call.